Having a well stocked pantry has been my saving grace more than once. The unexpected happens. Instead of panicking utilize your pantry. If the bulk grocery money for the week has to be spent on getting your car fixed, beans, rice, and pasta will keep you fed nicely. Lose power? That’s when things like nut butters, Sunbutter, crackers and other items that don’t have to be heated or refrigerated come into play. Having a well stocked pantry also helps when you have last minute company or you’re running late and have to get dinner on the table quickly. Keeping a stash of quick cooking foods like rice, pasta and canned beans along with items like canned tomatoes and pasta sauces can get a tasty dinner on the table in a flash. Canned black or pinto beans and rice can be spooned over tortilla chips and topped with salsa and a sprinkling of cheese for quick and tasty nachos. White beans and pasta in chicken broth with bits of carrots, onions, and garlic make a tasty soup. What you keep on hand depends on your family and its needs, likes and dislikes. Remember to occasionally rotate (eat) your stock. You don’t want to discover that all your emergency stock up has spoiled when you need it the most. To help you keep track of what you have on hand I have created a Pantry Staples List. I have some of the basic items filled in already with plenty of blank space to fill in what you have on hand that I didn’t list. 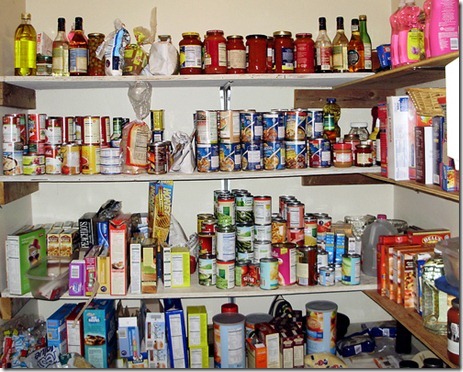 Need more ideas for your well stocked pantry?